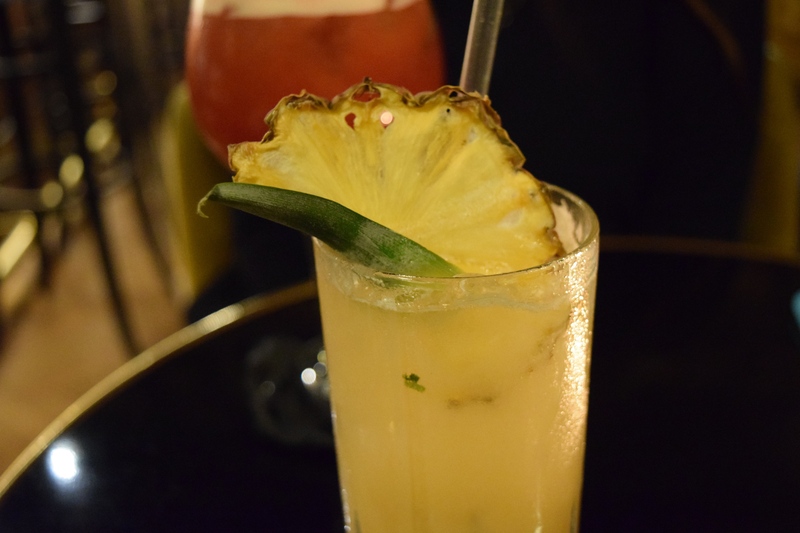 The left bank continues to step up on the Paris cocktail scene with its own speakeasy, Fitzgerald, hidden within a restaurant of the same name serving a simple, seasonal menu. 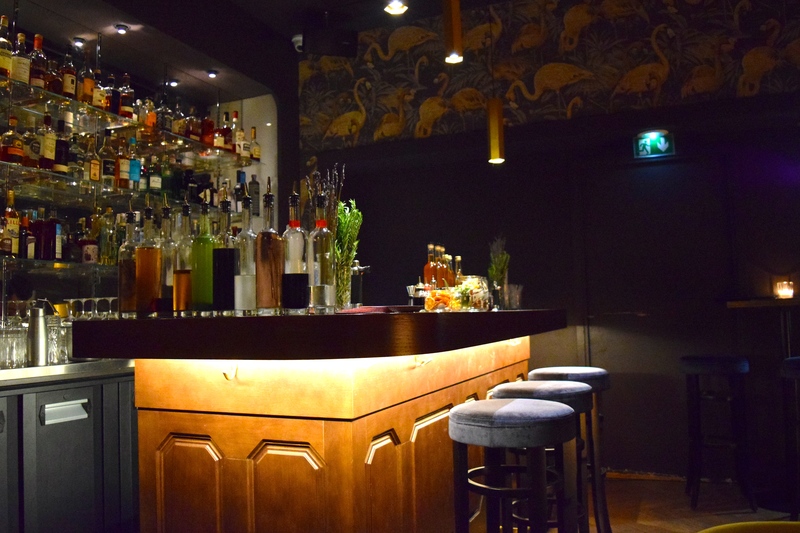 Located in a relatively residential area not far from the Eiffel Tower, Fitzgerald speakeasy is hidden behind the unmarked door at the back of a luminous, chic restaurant. Since opening, over a year or so ago, it’s polished itself up a bit and settled nicely into this somewhat traditional neighborhood. This lounge is small and cozy and offers an up-to-date take on decor of bygone days with stylish flamingo wallpaper and shabby chic velour banquettes. There are no doormen – no need for them. This is a lowkey lounge for well-behaved adults. 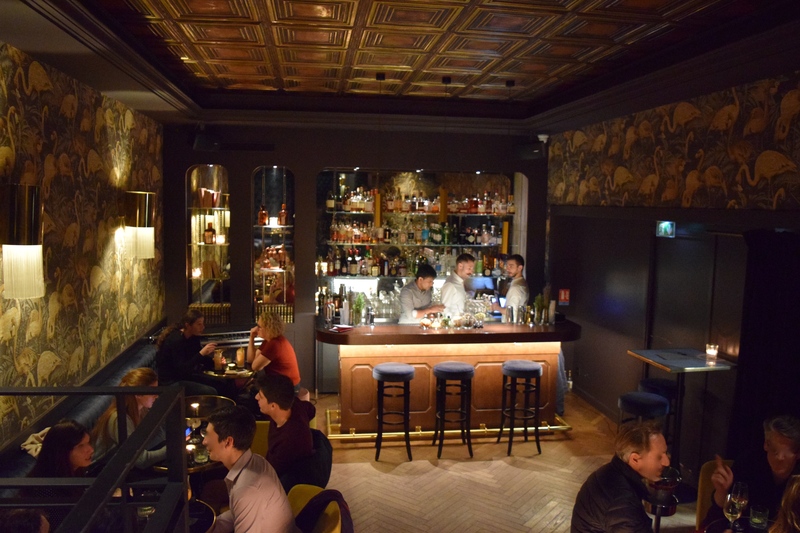 The hidden bar is probably the biggest surprise in the restaurant, which serves tried & true tasty options like Burratta, lamb tajine or prawn risotto. 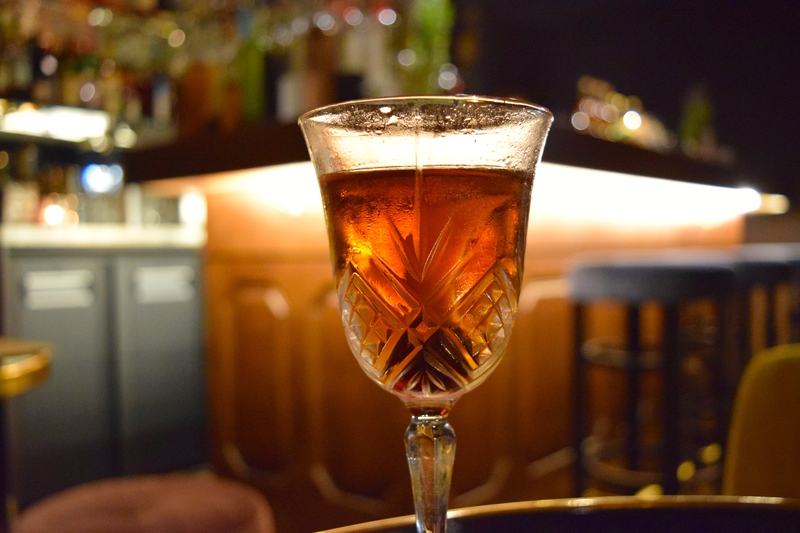 The cocktail menu follows suit with solid offers that don’t stretch cocktail boundaries – though they may stretch the palettes of Parisians unused to particular flavors like the bitter notes of their negroni with its tonka infusion (following the trend). Things here are conventionally good. And, that’s not meant pejoratively. While so many try to stretch their wings before properly learning to fly, it’s refreshing to see something that’s regular good stuff. And, ICYMI, cocktails are now mainstream, so your average customer is probably going to want a good standard on a regular basis rather than searching out the mindbending oddities that the cocktail geek may seek. The drinks are based on the usual suspects with whisky, vodka, gin and mezcal from solid nicely priced brands like Tanqueray, Monkey Shoulder, Plantation, etc. Their (literal) smoking cocktail carafe is a bit of a show stopper, but otherwise, the menu is pretty well packed with well-made adult beverages. They do up a decent martini and I’m pretty partial to their Guadalquivir with Bulleit bourbon, lustau Pedro Ximenz and Cointreau. Prices also hover in the “grown up range” from 13 to 15 Euros, which is a touch above average but unsurprising given the area and the ambience. Even their non-alcoholic option has an interesting angle with the xeres vinagar – though its name “Pregnant” is rather unimaginative (and frankly, a bit weird sounding…in that vein, why not just call it “AA” or “Birth Control”?) But I do digress… Bar snacks are what you’ll find at a french apero dinatoir: charcuterie, hummus, tarama. They also have a truffled croque which I also just noted last week in a menu – is this a thing? Again, nothing groundbreaking, but all very good. On my last visit, the place was nearly full just a half hour after opening. As a bonus, they open an hour before the restaurant, so you can settle in before dinner (this maybe gives the restaurant side some breathing room as well). Other extras: on the weekends you may see DJ’s and the space is privatizable (and would definitely impress your guests). Though I haven’t yet tried the restaurant, it looks good enough (and the bar snacks were tasty enough) that I will definitely give it ago. As for the bar, it feels off the beaten path without being eye-rollingly exclusive. It’s the right kind of addition to an area that is short on solid cocktail options. It’s a great address to have on hand when you’re strolling to or from the Eiffel Tower or just dining next door and want to surprise your dinner date with a little secret. It’s just what we need on this side of the Seine. And, frankly, maybe on the other side sometimes, too.